Get the most out of your workouts with TRAIL 29. Stabilise your hips, fix your foot and calf woes, use a mini-trampoline for cross-training, and find the best nutrition solutions in our latest issue. On shelves from 25 September 2018. 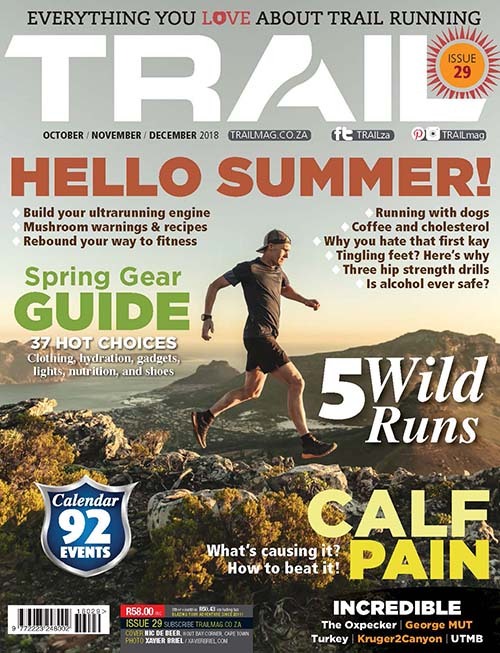 Get inspired, informed, and fast, with TRAIL 29! Build your ultrarunning engine, run with dogs, have a great first kilometre, and choose from over 90 local and international events in our calendar. TRAIL 29 will have you inspired, strong, and ready for your next big goal! You’ll find a smiling Nic De Beer on the cover, shot by Xavier Briel of The Mountain Room. Find the latest issue on your local newsstand, or buy TRAIL 29 and all previous issues digitally. What else is waiting inside TRAIL 29? 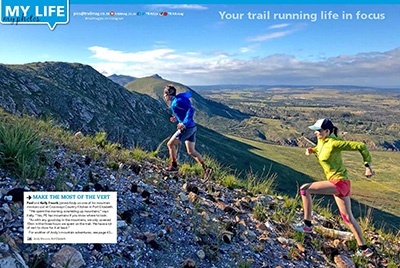 Take a peek into the lives of other trail runners in our reader photos section, with action shots all over South Africa. Read Patrick Willcock’s letter about a mischievous medic and burning nether regions. Our letter writers are rewarded with Feetures socks for their efforts. Humans are awkward creatures, and this doesn’t stop when they try get into mountain goat mode. In this issue’s TrailTalk, hear about fellow readers’ embarrassing trail moments. We showcase seven films already entered into the Trail Film Awards. 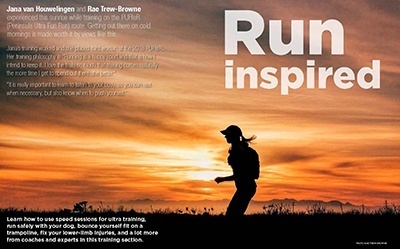 There’s still time for YOU to submit a running video and win prizes from Hi-Tec and Saucony! 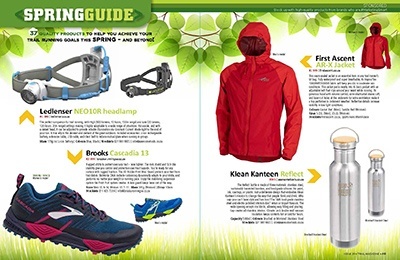 TRAIL 29 has a glorious nine-page Spring guide, packed with 37 products! We feature a selection from Aonijie, Biogen, Brooks, Buff, Capestorm, Enduren Nutrition, Feetures, First Ascent, Fuelbelt, Hi-Tec, Hydro Flask, Klean Kanteen, Knog+, La Sportiva, Ledlenser, Maurten, On, Patagonia, Pekant, Rugani, run angel, Salomon, Squirrel’s Nut Butter, and Thule. Get advice from podiatrists Craig Gornall, Nelfrie Kemp, and Dennis Rehbock on the shoe problems and other issues causing foot numbness and tingling. 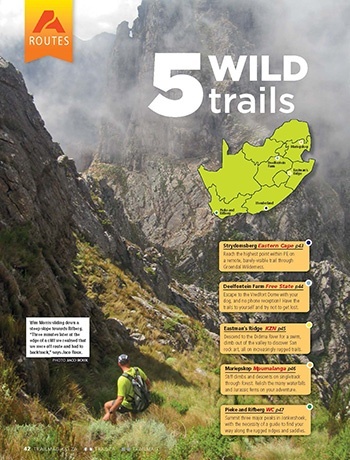 We found five wild trails from around SA that will challenge your navigation skills, and test your sense of humour. Catch up with South Africans racing across the globe: David Grier and Andrew Stuart running the Great Wall of China, Meg Mackenzie and Kane Reilly running the Golden Trail Series, Edson Kumwumba and 14 others at Mont Blanc Marathon in France, Naomi Brand in Mauritius, Keletso Nyathi is Cappadochia, Armand du Plessis in Norway, and nine Saffers at UTMB in France. Trail community leader Darren Smith shares his personal manifesto. Get to know ‘tough tannie’ 74-year-old Marianne Nelson who is churning through stage races and ultra marathons. What could be better than running for a good cause? South African expat living in Zambia Vicky Thompson ran 500km from Lusaka to Livingston, for clubfoot awareness. 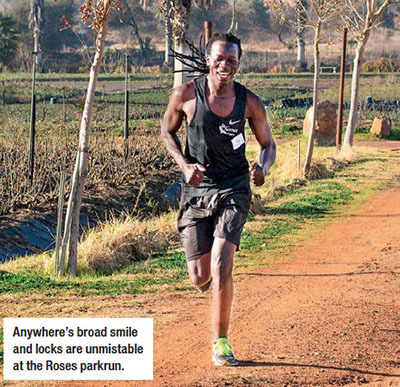 Anywhere Rusive has overcome a difficult start, and is running with a smile after coming to South Africa from Zimbabwe. Cover athlete Nic De Beer, with his 21-year running career on trail and tar, opens up about finding balance, major injury, and giving back. Scary experiences can form life-long bonds. Gina Chiesman recounts a near-death experience in the Drakensberg, and the loving marriage that resulted in our TrailTalk section. If you’re training for an ultra, and have thought about giving up speedwork, Coach Neville has some news for you! He explains how to build your ultrarunning engine using lactate threshold workouts. Running with your doggo means keeping them safe, listening to their needs, and knowing which of your training sessions suit them. Elite athlete and vet-in-training Nicolette Griffioen explains how to get the best out of your trail dog in Part Two of our Doggy Running article. Sleep is so important for your recovery, which is in turn important for your training. Dr Dale Rae, Director of Sleep Science at the Sports Science Institute of South Africa, gives her insights and advice. Some of us are prone to painful calves. Find out what you’re doing wrong and how to fix it with physiotherapists Neeshal Jogie and Tanya Bell-Jenje. Strength coach Elsabé Hunter provides three pelvic stabilisation exercises, in part two of her strength training for runners series! 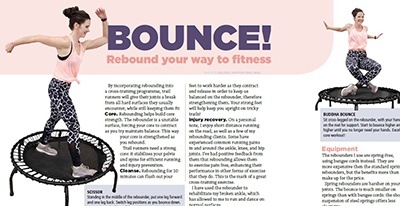 Bounce your way to fitness with rebounding! Personal trainer Hannah Thomson went to Hong Kong to study the space-age exercise on a mini-trampoline. “Why is the first kilometre of my run so much more difficult than the final kilometre? How can I make it easier?” Sean Tait of Off the Mark training gives a detailed answer to this question, including three phases of warm-up to prepare your muscles. 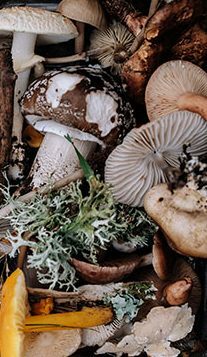 Mushrooms are a delicious part of your diet, but be careful to cook them properly, explains fungi expert Paul Stamets. Treat yourself to versatile rice cakes as trail fuel with our recipe. Make three-ingredient mushroom chips for an anytime snack, with Sara-Jane McShane‘s recipe. Research the link between cholesterol and coffee with Dr Michael Greger. Losing power? Sports anaemia can strike endurance athletes, but don’t reach for the iron supplement until you’ve heard it all from Naomi Brand and Christiaan Greyling. How detrimental is that post-race drink? Discover the long-term health effects of alcohol with Dr Gabe Mirkin. 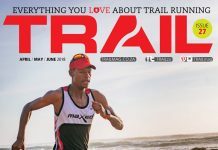 We look back at some of the bigger trail races that have taken place in South Africa, including Kruger2Canyon Challenge, George MUT, Featherbed Trail Run, JBayX, SOX, Whale of Trail, Run2Nowhere, Boston Trail Run, and The ITEC Oxpecker. There are over 90 events lined up from September to December 2018 from across South Africa. Get the details and start lining them up with the help of our online calendar! 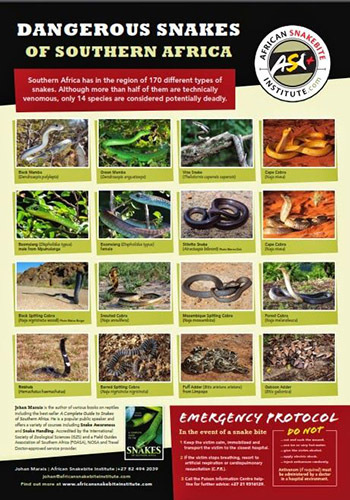 Get a free app to identify snakes and treat bites, from the African Snakebite Institute. Look to the future of water harvesting, reverse deforestation, transform the landscape with a miracle tree, and run Lake Malawi for the pangolin with Naomi Brand in our Green Shorts. 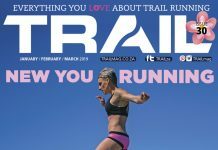 TRAIL magazine became South Africa’s first print publication dedicated to the booming worldwide activity of trail running in December 2011. 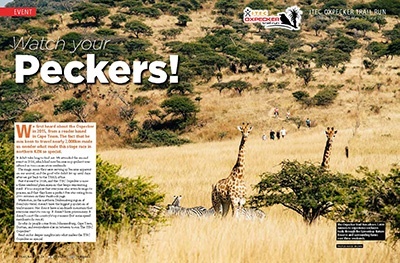 Since then the mag continues to enlighten its growing readership with the best places to run, the most suitable gear and the most popular trail running events from every angle; visiting the Himalayas, Sahara Desert, Amazon, and many local trails, including the famed Otter African Trail Run, Ultra-trail Cape Town, and the Salomon SkyRun. 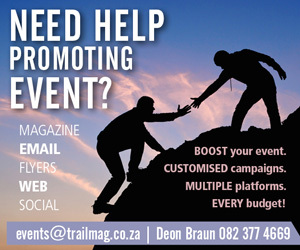 TRAIL retails for R58 (print) in 600+ outlets countrywide. So where do you find TRAIL? 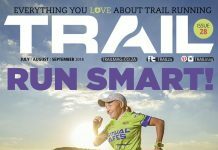 SA’s only trail running print magazine is available at CNA, Clicks, SPAR, Pick n Pay, Exclusive Books, Sportsmans Warehouse, and specialist sports retailers nationwide. The digital version is available on the App Store and Zinio for iPad, Android, iPhone, laptop and desktop devices in single issue and four issue subscriptions. 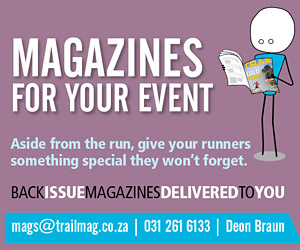 TRAIL is also available through Magzter. All back issues are available here, as a single issue or a package deal.